HÀ NỘI — Post Caesarean section complications, job security and many other issues are discouraging women, especially in big cities, from having more children while official policy encourages them to do so. The Ministry of Health’s Population and Family Planning Department has been planning ways to encourage women to have more babies in order to raise the nation’s fertility rate and maintain its “golden demographics,” when working people outnumber dependents. The golden demographics situation in Việt Nam is being undermined by lower fertility and mortality rates, leading to a rapidly aging population, experts have said. However, there are many barriers to women in urban areas, where fertility rates are the lowest, having more children. Lê Thị Mai Ngoan of Gò Vấp District in HCM City already has two sons, but because she and her husband were earning enough to bring up another baby, they decided to try for a daughter. However, just a few weeks into her pregnancy, she lost her fetus. Doctors found that the fetus was stuck in her C-section scars and posed a serious threat to her life if it was not removed surgically, the Sài Gòn Times reported. Nguyễn Thị Hoa, 26, of Hà Nội’s Mê Linh District, has a 4-year-old son and wants to have another child. But she and her husband are hesitant because they only earn about VNĐ9 million (US$396) per month. “If we have another baby, we won’t be able to meet our daily expenses,” she said. Many women living in major cities are also under high work pressure and do not want to have another child. Having another child would mean at least six months off from work, which might rob them of promotion opportunities or even cost them their job. The General Statistics Office has said that Việt Nam’s fertility rate (children born per woman) has plunged from 6.39 to 2.04 between 1960 and 2017. HCM City has the lowest fertility rate at 1.46 for the last nine years. Meanwhile, Việt Nam is ranked as one of five countries with the fastest rate of population aging in the world, and it is estimated that by 2050, some 25 per cent of Vietnamese will be senior citizens. Experts have said that the low fertility combined with population aging would reduce working-age people and significantly impact national socio-economic development. 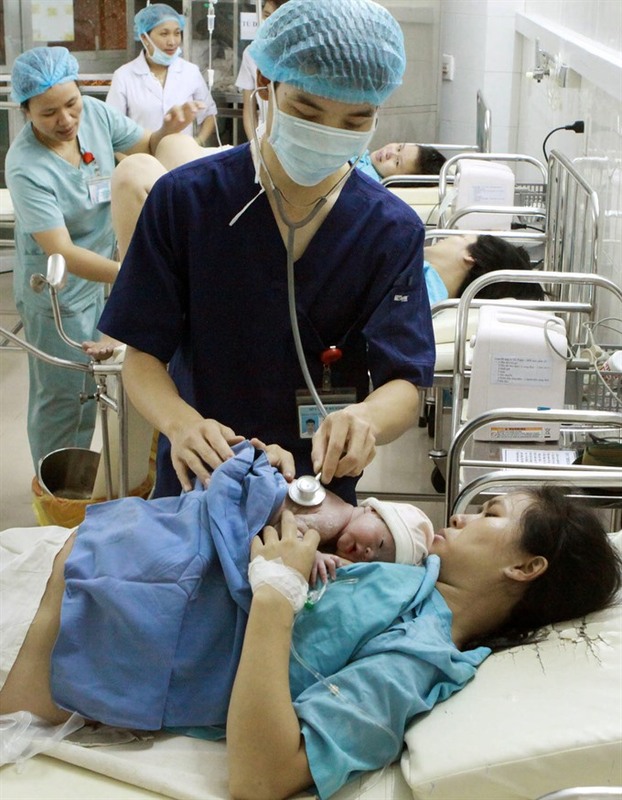 Nguyễn Bá Mỹ Nhi, deputy head of the Từ Dũ Hospital, said the ratio of women giving birth by C-section was high and rising in Việt Nam, so the risk of new fetuses stuck in old C-section scars also increased. “It makes women very worried about having more babies because it can be life threatening,” he said. The ratio of women giving birth by C-section is around 40 per cent in Việt Nam, against the 15 per cent that is considered healthy. Nhi said the Government should issue policies encouraging women to give birth naturally, without resorting to C-sections. Then they do not have to be afraid of having more babies, he said. The more the society developed, the lower the fertility rate, so current policies had to be changed to deal with the problem, Tường said. He noted that in some developed countries, the governments support women who deliver babies with daily expenses, tuition fees and other incentives. Women being treated for infertility also receive financial support from the governments, he said. "We should learn from this," he added. Women should also be offered longer maternity leave without the worry of losing their jobs, he said.